Corvettes and Mustangs and pieces parts, oh my! Mustangs and Vettes and parts, oh my! A lot of folks like to hear what we’re up to, and a picture is worth a thousand words, right? 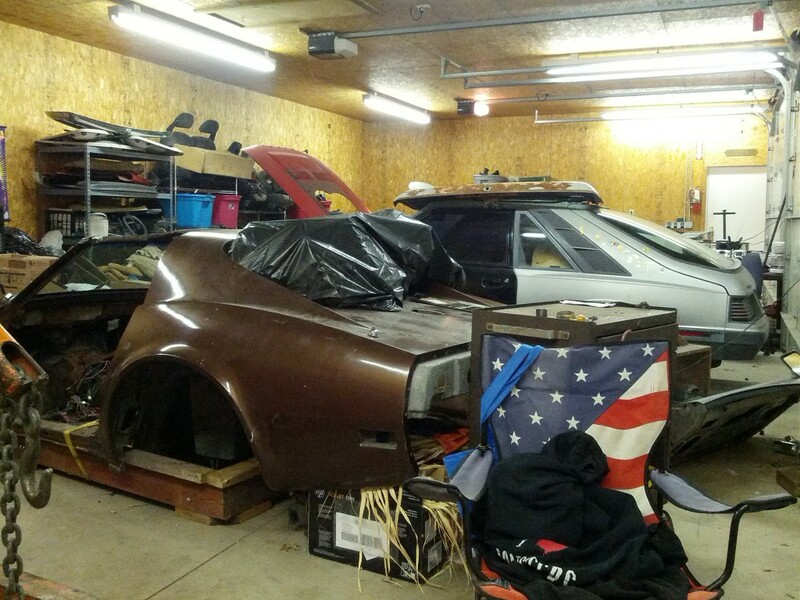 In the foreground is a 1974 Corvette we bought to strip the remaining parts off of… It had the two WORKING headlight buckets we needed for our Project77. Behind that is a 1985 Mercury Capri 5.0L. Classic case of started project, ran out of money. Since the car was dealer undercoated, everything underneath is pristine. The original doors and hatch were rusty but the owner had sourced replacements and they came with the car… We got basically everything except for the heads and intake. This one will likely go back together for sale. Too hard to find a nice fox body that is affordable. My husband has some evil plan for it, we’ll see. And then WAY in the back is a 2003 Mustang Premium Coupe that was my husband’s ex-wife’s car. It need a bunch of little stuff. We’re doing that stuff and then selling it. Oh… Husband… Yeah, Jerod and I got married on December 15th after a little over 5 years together. I decided that if I drop a car on my head I want him to be the one to be there to make sure my wishes are respected. Not that I don’t love my family, I just KNOW that he will do what *I* want. The same goes in reverse. He’s stood by me during this crazy dream, provided finances, countless hours of instruction, and backs me up 100%, all day, every day. He’s kinda cute, too. We’re working on getting more items up on the eBay store . We’re also actively posting on our Facebook page and we’re on twitter as fastwrecks. We hope all is well for you! Welcome to Sports Car Salvage. We are a niche hobbyist sports car dismantler located in Northeast Ohio, selling parts for C4 & C5 Corvettes, Mazda Miatas, and other sports and performance cars. We also restore diamonds in the rough. Let us help you with your restoration project. Subscribe by email to our FastWrecks blog posts.